The D&S Blog | Please pardon our appearance. We are using an off-the-shelf WordPress theme while we wait for a full website redesign. 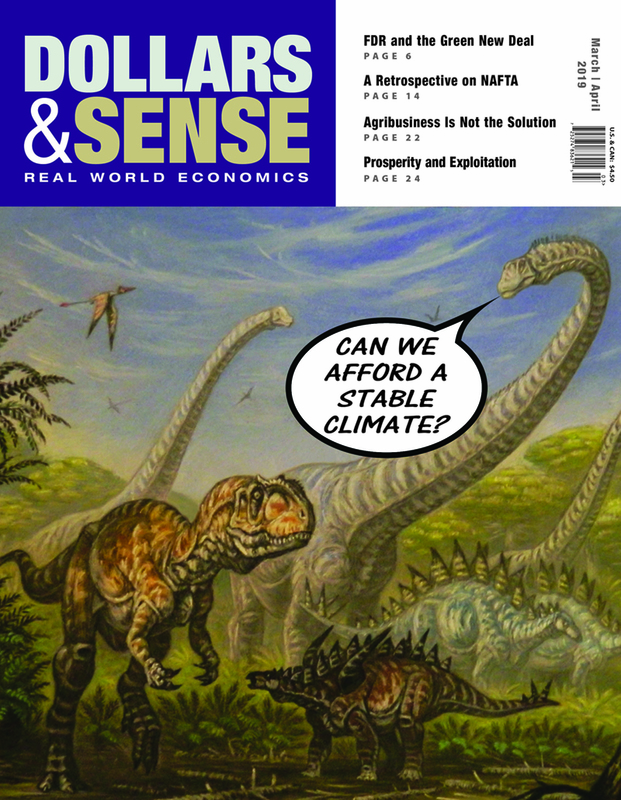 In early February, The Economist published an article, “A Bold New Plan to Tackle Climate Change Ignores Economic Orthodoxy,” lamenting the fact that the Green New Deal “largely dispenses with cost-benefit analysis.” This issue’s cover story by Frank Ackerman (one of the founders of Dollars & Sense) spells out just why ignoring economic orthodoxy, and cost-benefit analysis in particular, is exactly the right approach for climate policy. 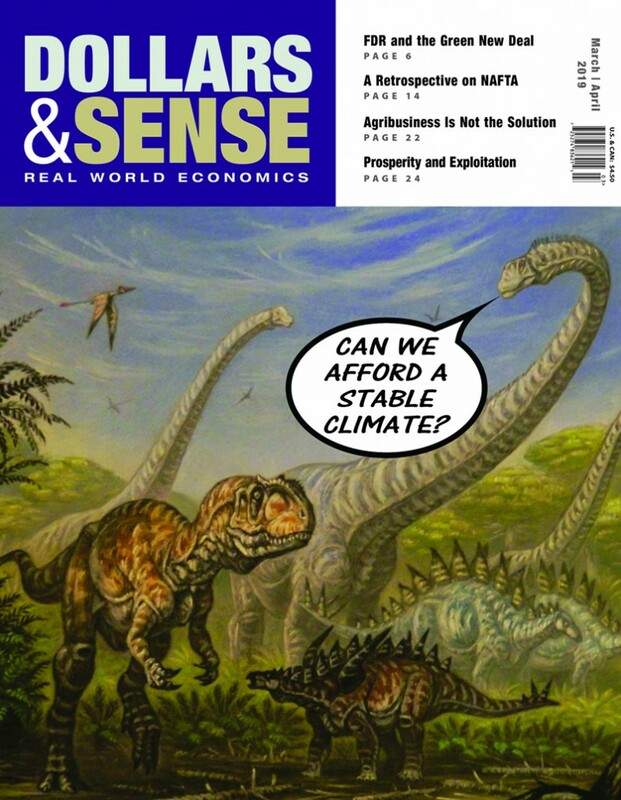 When we’re faced with uncertain but extreme risks, as we are with climate change, “policy should be based on the credible worst-case outcome, not the expected or most likely value.” Orthodox economists peddling cost-benefit analysis are like the dinosaurs on this issue’s cover—they should go extinct, as the dinosaurs did as a result of a changing climate. And the rest of us might well go extinct if we let economic orthodoxy determine climate policy. In our ongoing series on a federal job guarantee, Gertrude Schaffner Goldberg pays tribute to FDR’s Economic Bill of Rights, which turns 75 this year. Goldberg shows how the Green New Deal and related policy proposals could finally realize FDR’s vision and address the climate crisis and economic inequality at the same time. Ackerman also addresses the connections between economic inequality and climate justice in a long sidebar in his cover story. A second theme of this issue is one of our favorite topics, U.S. imperialism. Arthur MacEwan answers a question that Ryan Cooper, an astute journalist who writes for The Week, posed recently on Twitter: U.S. corporations clearly exploit people in developing countries, but does U.S. prosperity depend on such exploitation? Arthur’s answer introduces a class analysis to address how elites—both in the United States and in the developing countries that corporations exploit—benefit most of all from such exploitation. But so do the rest of us: ordinary people in the United States benefit from low-cost consumer goods, cheap gas, and higher wages trickling down from bosses’ superprofits. Higher living standards have long bought off a “labor aristocracy” that might otherwise have shown solidarity with exploited workers abroad. In the end, there’s no doubt that the exploitation of developing countries is one of the pillars of U.S. prosperity. U.S. agribusiness is one example of corporate exploitation of the developing world, as the eminent Malaysian economist Jomo shows in his review of the new book by former D&S co-editor, Timothy A. Wise, Eating Tomorrow. Agribusiness corporations influence government policies to favor large farms and industrialized agriculture, with disastrous results for small family farmers and the environment. And the history of U.S. relations with Mexico provides a perfect case study of U.S. corporate exploitation of the developing world, as James M. Cypher and Mateo Crossa show in their retrospective on NAFTA. The agreement was more about investment than trade, and most of all about corporate access to low-cost labor and resources. If anyone needed more reasons to be skeptical about the Trump administration’s recent saber-rattling at Venezuela—endorsed by too many Democrats—the authors’ long sidebar on how NAFTA fits into the history of U.S. designs on Mexican oil provides plenty. The long history of U.S. interventionism for oil is where the climate crisis and imperialism meet, with oil companies being the central villains. Let’s hope we can make them extinct, too. Last but not least, we continue our 45th-anniversary celebrations with another excerpt from our archives: from the year that NAFTA was initialized—1992—an article by former D&S staff editor Patricia Horn on the economics of violence against women. We at Dollars & Sense are pleased to welcome Elizabeth T. Henderson to our staff as co-editor! Liz previously worked for several years as an editor at the Indypendent in New York City. Her reporting has appeared in Dissent, The Nation, Waging Nonviolence, and the Indypendent. Liz brings extensive editorial, reporting, and fundraising experience to D&S, and her amazing organizational skills are already leaving their mark on the D&S office and our production schedule. Welcome, Liz! Is Bolsonaro “The Trump of the Tropics”? When the Brazilian presidential elections announced Jair Bolsonaro as the winner, the U.S. media almost immediately started to draw similarities between Brazil’s new President and Donald Trump, baptizing him as “the Trump of the Tropics.” They actually seem to share some characteristics, such as high social media presence, anti-minorities speeches (targeting immigrant and LGBT communities, mainly), they are both married to women 24 years younger than themselves, and both definitely share a terrible taste in haircuts and ties. When we try to stretch those similarities for economic and political positions, though, we need a closer look at both economies to understand why Bolsonaro’s “Brazil above everything, God above everyone” can sound as nationalist as Trump’s “Make America Great Again,” but that so-called nationalism translates to different—even opposite—policies in each country. One could argue that Trump is only taking credit for good economic results that are the sum of a lucky international environment with lagged effects of some of Obama’s policies, but it is true that, after he started working in the White House, the unemployment rates and GPD growth are doing very well. Bolsonaro, though, gave credit to Trump. Even though he repeatedly emphasized that he doesn’t know a thing about economics and everything should be decided by his Minister of the Economy, he was very much impressed with what Trump was doing in the United States, so promised to do something similar in Brazil. In his campaign, a number of his supporters used Trump-Bolsonaro T-shirts and reemphasized this view that, somehow, making economic decisions for a country is like a cake recipe that can be cooked in any kitchen; what works in the largest and most powerful economy of the planet should definitely work for a middle-income country with one of the highest inequality levels in the world, where more than 20% of the GPD comes from agriculture—and agricultural participation is actually rising, indicating a deep deindustrialization process. If “I’m going to do what Trump does” is not a very good idea to start with, all signs seem to indicate that what he meant was “I’m going to do whatever I think that Trump would like me to do,” which could be even more harmful for the Brazilian economy. Bolsonaro is pushing the idea that being friends with the US is being great, and the nationalism that he is trying to promote is one in which we don’t really care about our cultural and environmental resources—probably Brazil’s greatest riches—as long as the north American investors like us a lot. The nomination of Paulo Guedes as the Minister of the Economy was an important movement to achieve that goal. Guedes got his Economics PhD in the University of Chicago and openly defends the ideas of Milton Friedman—the Nobel Prize winner, responsible for Chile’s unpopular economic plans during Pinochet’s military dictatorship. Friedman was the only reference in Bolsonaro’s government plan, which consisted in a slide presentation with little information about concrete economic measures. According to his speeches, the plan is to privatize every state-owned company, including state parks stablished to preserve native rainforest, the social security system, the post office and massive national companies like Petrobras (the Brazilian Petroleum Corporation, ranked #58 in the most recent Global 500). Cutting taxes is also in the agenda, and—as opposed to what Trump is doing to China—the import taxes are the first target. If selling the most profitable companies in the country and reducing federal taxes during a deep economic crisis with consecutive primary public deficits doesn’t sound very nationalistic, contributing to the fast deforestation process that has accelerated deeply since 2017 is probably even less patriotic. When Bolsonaro was still a congressman, he tried to pass a law forbidding environmental agents to carry guns after he got a fine for fishing in a protected area—which is very weird coming from a man who loves guns so much that his symbol during the presidential campaign was making little pistols with the fingers, gesturing toward his promise to soften gun laws. Since his election, he already stated that we need to stop the “industry of environmental fines”, tried to merge the Ministry of the Environment with the Ministry of Agriculture and declared in interviews, speeches and lectures that Brazilian indigenous population needs to get a “proper job” (12.5% of the country’s territory is occupied by native populations, the majority of them live in preserved areas where intensive farming is forbidden). On the other hand, good signs for “the market” didn’t seem to be much of a problem when Bolsonaro announced that he would follow Trump and move the country’s Embassy in Israel from Tel Aviv to Jerusalem. International relation experts agree that, as response to that threat, Egypt cancelled the 2nd Brazil-Egypt Forum of Investment Opportunities and Saudi Arabia announced a reduction in Brazilian chicken imports (the country is the largest buyer of the product, responsible for more than 12% of Brazilian chicken exportations). The Middle East in general responded for a positive trade balance of US$10 billions in 2018, and a possible boycott from the region could have devastating effects for the external accounts. International trade with Israel generated approximately a positive balance of US$1 billion in the same period—a number that will hardly increase considering Israel’s importing capacity. Following Trump’s decision of revisioning the NAFTA agreement, Bolsonaro also announced that the MERCOSUL (the Southern Common Market) needs to be reevaluated; the group was responsible for buying more than 15% of Brazilian total exports in 2018. If Brazil’s new “nationalist” president is not particularly worried about protecting the country’s natural resources, neither about giving public statements that can negatively affect the macroeconomic indexes and international relations at least in the short run, maybe he promotes the Brazilian culture in culinary, arts and folklore—like Trump’s attitude of delivering Mc Donald’s burger in the White House because “it’s American traditional food”, regardless of how cheap, unhealthy and terrible tasting it is. But that’s not the case. Bolsonaro closed the Ministry of Culture for good and pushed it into the Ministry of Sports; he also wants to cancel all federal investments in Carnaval—one of the most popular parties of the world, that generates massive profits for the service sector—showed great disrespect for all African-Brazilian manifestations and, as result, bought a fight with Brazilian artists (Caetano Veloso, Chico Buarque, Gilberto Gil, Fernanda Montenegro, Wagner Moura and a long list of internationally celebrated performers declared disagreement with his platform). When asked about what his favorite book was, the president couldn’t cite any literature piece; instead, he answered A Verdade Sufocada (The Suffocated Truth), a book by Carlos Alberto Brilhante Ustra which hasn’t been translated into English. Ustra was the first military official to be recognized by a civil court as a torturer during the military dictatorship; his torture center was responsible for more than 500 deaths. If Brazil is known for its great natural resources and diverse culture, this is probably the first time in history that a president dedicated to not caring about any of those is celebrated as a nationalist. For a developing country like Brazil, to put “Brazil above everything” seems to be synonymous with becoming very close friends with the White House and convincing them that we are nice people, so they should give us some money in the form of international assents, buy our state-owned companies, and buy more of our products. Forget about unemployment, wage distribution, and giving Brazilians decent standards of living; the new face of nationalism cares more about having a Disneyland in Brasilia, with a Brazilian flag next to the U.S. flag, as promised by the Federal District (and already disclaimed by Disney). Débora Nunes is a graduate student in economics at Colorado State University.